Billy Graham was born on a dairy farm near Charlotte, North Carolina. His mother and father Morrow Coffey and William Franklin Graham managed the farm. They were devout Christians and Graham's mother had a big influence on his faith. In 1933 Graham's father forced Graham and his sister Catherine to drink beer until they vomited. This made them hate alcohol for the rest of their lives. 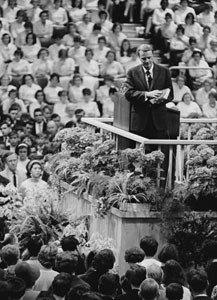 The Billy Graham Center says Graham was converted in 1934 during a revival meeting in Charlotte led by local evangelist Mordecai Ham. However, he did not become a member of a local youth group because he was "too worldly". After graduating from Sharon High School in May 1936 Graham went to Bob Jones College (now called Bob Jones University). In 1946, Graham married a girl who was in a class with him, Ruth Bell. Her parents were Presbyterian missionaries in China. Her father, L. Nelson Bell, worked as a surgeon there. When talking about Bell, Graham said "She looked at me and our eyes met and I felt that she was definitely the woman I wanted to marry." Ruth said that he wanted to please God more than any man she had ever met. They married two months after they graduated from college. After marriage, they lived in a log cabin that she had made. Ruth died on June 14, 2007, at age 87. They had five children together: Virginia (Gigi) Graham Foreman; Anne Graham Lotz; Ruth Dienert; Franklin Graham, and Ned Graham. They also have 19 grandchildren and 28 great-grandchildren. Graham held many revival meetings in Los Angeles in 1949. These revivals are thought to be the time when Graham became a national religious figure. This is because he got help from the powerful newspaper man William Randolph Hearst. Many people believe that Hearst liked Graham for his love of his country. It is also believed that he may have thought that Graham could help with his conservative, anti-communist views. Hearst sent a telegram to his newspaper editors reading "Puff Graham" during Billy Graham's late 1949 Los Angeles crusade. Therefore, one could read much more about Graham now in Hearst's newspaper chain and national magazines. That meant that his crusade event could run for eight full weeks — five weeks longer than planned. Henry Luce put Graham on the cover of Time magazine in 1954. Graham went to China, where his wife Ruth was born. He also appeared in North Korea in 1992. On September 14, 2001, shortly after the September 11 attacks, Graham led prayer at the Washington National Cathedral. President George W. Bush went to this service. On June 24, 2005, he began what he said would be his last North American crusade. On the weekend of March 11 and March 12, 2006 Billy Graham held the "Festival of Hope". It was held in New Orleans, which was recovering from Hurricane Katrina. Graham said that he had to retire because of his failing health. He has had Parkinson's disease for about 15 years, as well as many other problems. In August 2005, though weak, he used a walker to go to at the start of his library in Charlotte, North Carolina. On August 18, 2007, Graham, aged 88, was treated for intestinal bleeding. 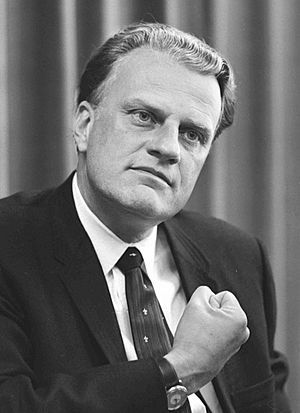 Billy Graham has preached Christianity to nearly 215 million people in more than 185 countries and territories. Graham has also preached to hundreds of millions more through television, videos, movie, and webcasts. He has been to over 41 evangelistic crusades since 1948. He began this ministry in 1947, and kept doing it until recently. He would often use a big area, such as a stadium, park, or a large street to speak at. Groups of up to 5,000 people would often sing in choir at his meetings. Graham would preach the gospel and then invite people to come forward. In 1992, one-quarter of the 155,000 in his Moscow audience came for Salvation upon his request. Graham died from Parkinson's disease on February 21, 2018, at his home in Montreat, North Carolina, at the age of 99. In politics, Graham was a member of the Democratic Party, but changed to Republican during the presidency of his friend Richard Nixon. He is no party member, because he says that Jesus did not have a political party. Though he does not support people running on politics in general, he has given his support in some cases over the years. Graham has spoken at many funerals over the years, but he was unable to do Reagan's on June 11, 2004, because of recent hip surgery. Graham had been Reagan's first choice. Bad health also kept Graham from doing the funeral of President Gerald R. Ford in Washington D.C., on January 2, 2007. Graham spoke against communism. He was in favor of the U.S. Cold War policy, including the Vietnam War. However, in a 1999 speech, he talked about his relationship with the late North Korean dictator Kim Il-Sung. He said that he was a "different kind of communist" and "one of the great fighters for freedom in his country against the Japanese." Graham went on to say that even though he had never met Kim's son and former North Korean dictator Kim Jong Il, he had "exchanged gifts with him." Graham has given a globe covered with doves to the North Korean Friendship Museum. Between 1950 and 1990, Graham appeared many times on Gallup's list of most admired people. The United States Postal Service has said that he is one of the few Americans, along with the current President, who can get mail that simply says his name and country: "Billy Graham, America". He has received the "Congressional Gold Medal" from the United States Congress and the "Presidential Medal of Freedom" from Reagan, America's highest civilian honors. President Bill Clinton and former Senate Majority Leader Bob Dole gave Graham the "Congressional Gold Medal" at a ceremony in Washington D.C., in 1996. The George Washington Carver Memorial Institute has honoured his work to help make better relationships between people of different races. Billy Graham Facts for Kids. Kiddle Encyclopedia.